An evacuation order for the Thomas Fire and Sherpa/Whittier Fire burn areas takes effect at 10 a.m. Tuesday, according to the Santa Barbara County Sheriff’s Office. 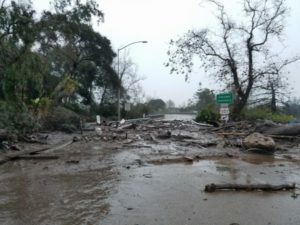 In the event of significant debris flow, residents living in the evacuation areas, particularly in Montecito, Summerland and Carpinteria, could become stranded if roads are damaged or rendered impassible. Montecito was the community hardest hit by the Jan. 2018 debris flows that killed 21 people. The Thomas Fire ravaged the area weeks prior to a storm that resulted in large debris flows. Many residents failed to comply with evacuation orders in the lead-up to the Jan. 2018 storm. The incoming storm is expected to subside Tuesday night. Then, another storm of similar intensity is expected to arrive Wednesday evening. El Montecito Pre-School and Crane Country Day School will be closed because of the storms. Meanwhile, Lady of Mount Carmel, Montecito Union School and Laguna Blanca Lower School will operate at alternate sites. Carpinteria Unified schools and all other Santa Barbara County campuses will remain open during the anticipated storms. A Red Cross evacuation center has been set up at the Goleta Valley Community Center located at 5679 Hollister Avenue in Goleta. The Santa Barbara Humane Society and Santa Barbara County Animal Services will provide shelter for small animals, while evacuees can take large animals to the Earl Warren Showgrounds. Bla,bla,bla…Ive never lived anywhere where the weather reports and “sky is falling” predictions are so off. Maybe its time for some flood control upgrades instead of more bars. Where else in the world can a flood control channel be built for $millions of dollars$ and then rendered useless because of weeds and a 3 eyed polliwog.Pitiful stupidity.